On 21-22 February 2019, the Centre for European Policy Studies (CEPS) is holding their annual Ideas Lab on the theme of "Europe's Choice" in Brussels, Belgium. The CEPS Ideas Lab aims to serve as a unique platform outside the established channels to question commonly-accepted policy positions and look for new approaches to meet the challenges faced by Europe and the world. Lab sessions are organised in small, informal groups designed to foster creative and collaborative thinking; they aim to create a stimulating atmosphere that produces new ideas and concrete policy recommendations for the work of the EU institutions, national governments and international authorities. 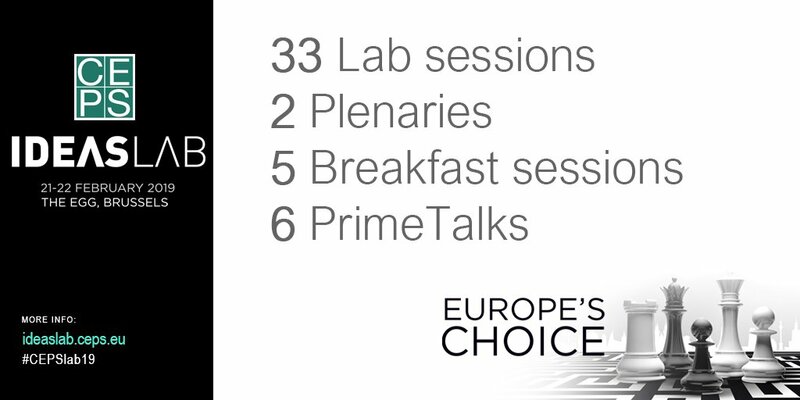 The larger sessions offer political leaders a platform from which to reach a pan-European audience of opinion-shapers and to show that their policies are pro-citizen. This year’s theme is "Europe’s Choice". It implies a Europe of shared values and a Europe that is based on institutions that allow member states to enhance their own sovereignty by sharing it with others. These values and the institutions underpinning them are threatened by a rising populism, which does not accept the values and the checks and balances embodied in the European institutions and treaties. Many politicians are seeking to achieve short term political gains, putting at risk what has been painstakingly constructed over generations. This choice will play out both in the elections to the European Parliament and in the Leaders Agenda for the EU summit in Sibiu, 9 May 2019. This fundamental issue will be addressed at the Opening Plenary of the CEPS 2019 Ideas Lab, to which CEPS has invited the President of the European Council, Donald Tusk. Key values to be discussed include solidarity, unity and respect for the democratic principles of the EU. After the Opening Plenary, lab session will focus on the concrete challenges ahead for the EU, exploring how they can be tackled in a way that permit citizens to see concrete value added from Europe. A key issue will be cohesion: What has been achieved in terms of convergence and how will cohesion shape the new Multiannual Financial Framework (MFF) 2021-27. Will there be less movement of workers when the new member states converge? What is the role of the reformed regime for posted workers? Finally, discussions will focus on how the EU can help restore order to a world whose very foundations are being attacked by the US, and how to organise its relations with its immediate neighbourhood, especially those nations that remain deeply committed to a European destiny.